My friend Kathie called to see if we would be up for making a Little Red Riding Hood cake for her daughter Emma’s 4th birthday. I have been working all nights this last week and have three more ahead of me next week so I asked Cort and she was totally up for it. I baked the cake but she did all the decorating as I was trying to sleep and recover from working all night and she did a great job! I think this cake is so cute! It’s white cake and buttercream frosting and Duff’s fondant for the red and Pettinice for the white. 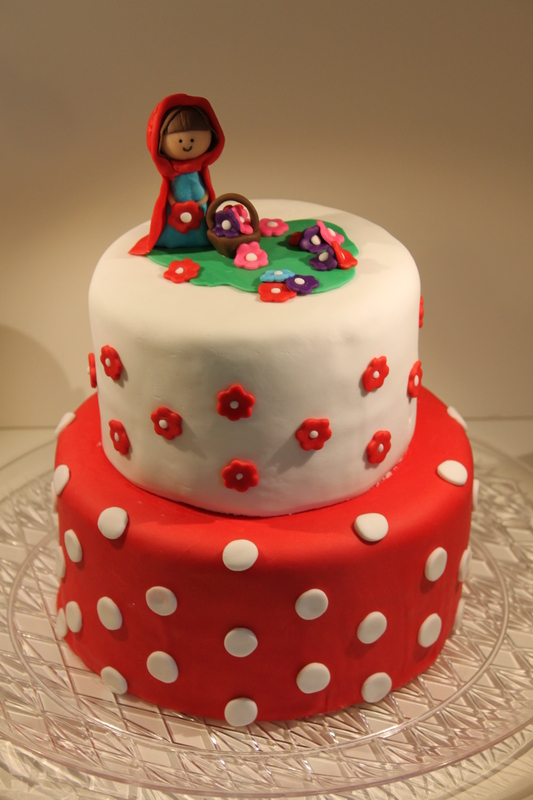 She sculpted Little Red Riding Hood out of fondant to match the invitations for Emma’s party and she came out so darling. Happy Birthday Emma! Very Nicely done! I love it! Thanks, we thought it came out pretty good too, Courtney does a great job!